There has been a big shift in the Eskimo Prince Stakes 2017 betting markets for the Group 3 at Randwick on Saturday with the announcement the Chris Waller-trained favourite Omei Sword won’t be running. Omei Sword has been scratched from the Eskimo Prince Stakes but could resume Saturday week in the Light Fingers Stakes 2017. Photo: Steve Hart. On Friday morning Waller confirmed his High Chaparral filly would be scratched from her first-up run in the $150,000 Group 3 Eskimo Prince Stakes (1200m) due to a minor muscular issue. 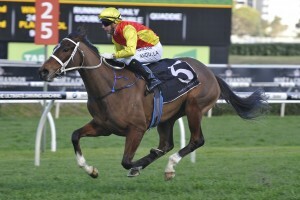 “Omei Sword will shortly be withdrawn from tomorrow’s Eskimo Prince at Randwick,” Waller confirmed in a statement. The $200,000 Group 2 Light Fingers Stakes (1200m) runs at Randwick on the same day as the $250,000 Group 2 Apollo Stakes (1400m) where Omei Sword’s champion stablemate Winx runs first-up. Omei Sword was dominant favourite in the Eskimo Prince Stakes odds at Ladbrokes.com.au, but the punters will have to wait for her highly-anticipated return to racing. Winner of the Group 2 Silver Shadow Stakes (1200m) at Randwick first-up last August, she went on to run second behind Astern in her only other spring run in the coveted Group 1 Golden Rose Stakes (1400m). Despite the distance between runs, Omei Sword is tipped as one of the key three-year-olds to watch this autumn in Sydney and Melbourne. She is nominated for a Flemington run on March 4 in the $750,000 Group 1 Australian Guineas (1600m) and is the early $9 favourite in the pre-field markets at Ladbrokes.com.au. The updated Eskimo Prince Stakes odds now feature a logjam of hopefuls fighting for favouritism. Of the eight three-year-olds left to contest the set weights plus penalties sprint, five are at single-figures to win including new top fancy Bezel ($3.60). Coming into Omei Sword’s original barrier of three, the John O’Shea-trained Street Cry colt is one of two young Godolphin gallopers in the race. James Doyle rides Bezel first-up with the consistent performer’s last start on Victoria Derby Day in Melbourne producing the narrow third beaten a quarter-length in the Group 3 Carbine Club Stakes (1600m) on the back of three straight wins. His stablemate Bryneich meanwhile has Brenton Avdulla in the saddle again on the back of a soft four and a half-length win over 1250m at Canterbury on January 20 where he didn’t come anywhere near emptying the tank. Bryneich pays $6.50 to win the Eskimo Prince Stakes, while three others along with Bezel are shorter in the markets. The Kris Lees-trained Northern Meteor colt Guard Of Honour ($4.60), big market mover Spending To Win ($8.50 into $4.80) for Peter & Paul Snowden and Waller’s remaining runner Comin’ Through ($4.80) are all being kept safe in betting. Michael Walker rides the well-bred half-brother of multiple Group 1 winner Criterion Comin’ Thorough in the race after two Randwick trials in January. Walker was also in the saddle for the Fastnet Rock colt’s Carbine Club Stakes win in late October. Check out the updated Eskimo Prince Stakes 2017 odds below before heading to Ladbrokes.com.au to place your weekend racing bets at the best prices!